The Westhill Country Hotel is a family-run hotel which sits in its own 5 acres of superb private grounds and landscaped gardens. The Westhill Country Hotel is a family-run hotel which sits in its own 5 acres of superb private grounds and landscaped gardens. Nestled between St. Helier and the countryside, this fantastic setting provides guests with every opportunity to relax, unwind and appreciate Jersey’s natural beauty. 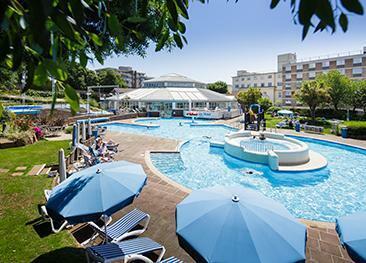 The hotel features plenty of on-site activities for children and adults, including in-house evening entertainment, two heated swimming pools, a selection of bars and a children's outdoor adventure area. All rooms are en-suite and equipped with colour television, radio, hairdryer, telephone,free WiFi, baby listening facility and tea & coffee tray. Choose from single, double, twin and family rooms. The View Restaurant offers a fantastic buffet breakfast and full English breakfast. An evening menu and snack options are also available. Serves lunch and snacks by the pool when the weather allows. The Twilight Room offers evening entertainment five times a week between May and September. Music, dancing, quizzes and bingo nights are held. Discover the woodland path and nature trail within the hotel's grounds. A weekly golf day is organised by the hotel's owners at Les Mielles Golf & Country Club. Table tennis, table football and a pool table are also available. There is no facility for disabled access. 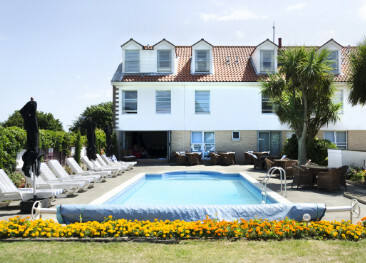 The Westhill Country hotel is in a beautifully secluded rural setting within a few minutes’ drive of St Helier’s town centre - ideal for enjoying walks as well as indulging in a bit of shopping. Brilliant hotel. Very friendly, helpful staff. Excellent food. Have visited 5 times and would certainly go back again. Excellent service, Good all round experience. Hotel needing to give more attention to resolving problem of step in dining room which is a health and safety issue. We have used the Westhill for a number of years. The family run hotel is very friendly, the staff can't do enough for their guests. Food as always is excellent as are the pool and gardens. Downside no ground floor rooms and no lit. Stayed with my my 88yr old m-in-law who struggled to manage the stairs. 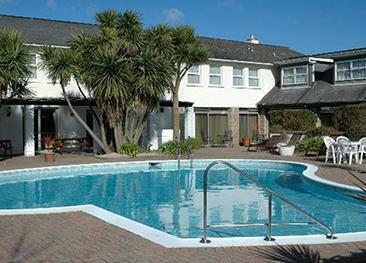 Westhill Hotel ticks all the boxes for us. Beautiful setting on 12 acres site. Family owned with first rate service to their visitors. Excellent food and extremely helpful friendly staff. Everything was satisfactory. My only negative comment would be the bus service to and from town could do with more timed return journeys. The staff at the hotel and the food are excellent. Quality hotel, good food, quite location.